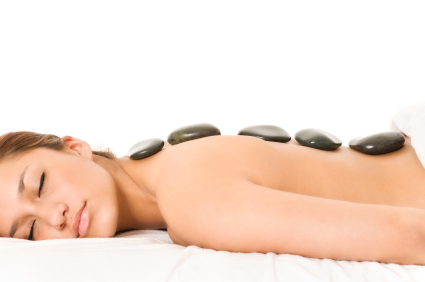 Hot Stone massage is a specialty massage that utilizes smooth, heated stones. They are often basalt, a black volcanic rock that absorbs and retains the heat well. It is a deeply soothing, relaxing form of massage. The heat helps with tight muscles and releases them. The stones are heated in water that is between 120 and 130 degrees. The therapist uses traditional strokes of Swedish massage and then goes back over the area holding a hot stone. The therapist will usually leave heated stones in specific points along the spine, or in the palms of your hands, or even between your toes to improve the flow of energy in your body.